There will be departures from the Marcliffe at Pitfodels, the Copthorne and Old Aberdeen (for King's Hall). Participants may return with the coach to departure point, or may opt to stay in the city centre, making their own arrangements to return to their hotel. The tour will include Aberdeen city centre, West End, Old Aberdeen Beach area, a walk through Fittie (old fishing village), the harbour area and Duthie Park with its famous indoor winter gardens. As your tour the city centre and west end with your guide, you will come to realize why Aberdeen is known as "The Granite City". 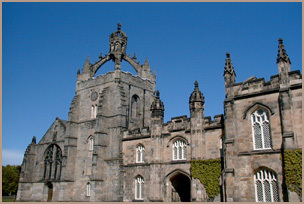 In Old Aberdeen you'll see both old granite and old sandstone buildings, one of them believed to be the oldest granite cathedral in the world! The golden sandy beach is popular with locals when the weather's good (even in winter), but sea temperatures rarely rise above 13 deg C and you will be invited to walk with your guide through the historic and charming fishing village of Fittie, which can only be seen on foot. You're almost guaranteed to be fascinated by the busy modern harbour, which is extremely important for the offshore oil industry, and is also Great Britain's oldest business, founded in 1136! Aberdeen's favourite public park is named for Miss Elizabeth Crombie Duthie, who in the late 19th century gifted land to the city for use as a public park. Here you can visit the Hill of Roses and the Winter Gardens, one of the largest indoor gardens in Europe.